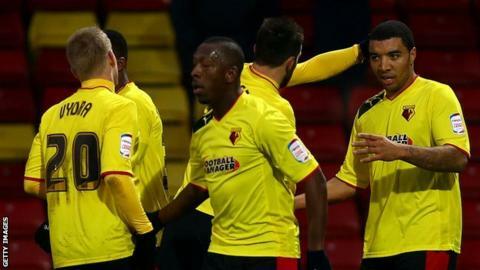 Matej Vydra scored twice and won a penalty as Watford cemented their place in the top six and left Huddersfield without a league win in 12. Troy Deeney opened the scoring from the penalty spot at the end of the first half after Callum Woods fouled Vydra. The Czech international then doubled the lead when he converted an inswinging cross by Marco Cassetti. He swept home his second before Cristian Battocchio scored his first Hornets goal with two minutes to go. A late penalty from Troy Deeney gave Watford a 3-2 victory in the reverse fixture in September, and denied Huddersfield the chance to go top of the table, a far cry from their current position. The best chance for the away side fell to Jermaine Beckford but his header was superbly saved one-handed by former Arsenal goalkeeper Manuel Almunia. After beating Charlton in the FA Cup at the Valley, Huddersfield should have gone into the game full of confidence but the frailties, which have seen them fail to win a league match since 10 November, were evident. Deeney, who was making 100th appearance for Watford, hit the bar for the home side before he had another effort cleared off the line. Simon Grayson's team failed to heed the warning and handed the home side the perfect opportunity to open the scoring from the penalty spot and Deeney made no mistake. Gianfranco Zola's men, who are the division's leading scorers, quickly added to their tally when Vydra stretched to meet an inviting cross from Cassetti. He then made sure of the points when he scored his 16th goal of the season after Deeney this time turned provider and sent him clear. Huddersfield, who now sit 18th in the Championship table, offered little in attack and Battocchio completed the scoring with a lovely flick into the back of the net with the outside of his boot. "I just found out that this morning more than 100 supporters turned up here to help clear the pitch of the snow, so I think they've been rewarded with this performance and they deserved it. "I think we've played some better games than this but it was a mature game. The result is a little bit too hard towards Huddersfield because in the first half they made it very, very difficult for us, so we had to work hard. "I think the goal towards the end of the first half helped the team a lot because we then, in the second half, managed to play the football that we want to play. They had to open up a little bit more." "I thought, first half, we were well and truly in the game. We kept them quiet, you could sense the atmosphere had gone quiet as well and the decision just before half time changed the game. "We let it affect us and it obviously gave them a big confidence boost. The decision was wrong, it's great tackle by our right back and it's outside the box, so it's a poor decision. "But in the second half we felt sorry for ourselves and allowed Watford to dictate the game and when you do that against a team like Watford then you're under pressure because they're a good side."